Just what American needs, a medieval monarch. Just what Christ had in mind: opulent robes, gold trim, courtiers, pageantry, all on behalf of hierarchy. The ornate robes and crown are gone, leaving the human person who temporarily inhabits the institutional role. The off-write robe or shawl could be a rough covering against the cold, or a shroud. The bare head, thin, white hair, and almost fearful expression suggest vulnerability, yet his eyes are resolutely open to what awaits him. He is illuminated from above, but the light bathing him seems not to confer a blessing but to call him toward the next realm. The shadows along his face and body cue the sense of pending mortality that suffuses the picture. The first photograph allows ironic contrast between the majestically robed pope and the body of Christ on his scepter. No irony is intended, of course, but instead the suggestion of a common immortality: Christ in heaven and the universal church. In the second photograph, I see only one body: the mortal body, seen to be aging where not covered with common cloth signifying the grave. The scepter has changed as well: in place of the tortured Jesus, only a small cross. Most tellingly, in the center of the metallic halo, one sees a translucent circle. Note also how the light illuminates both the pope’s head and the center of the sceptered ornament. One can see a human being and the mechanism of the church. One can imagine that he will at the last see an aperture to heaven, or only emptiness, diffusion, nothingness. There need be nothing parochial about that choice. Instead of the Grand Inquisitor, this pope, for one moment, bears witness to the human condition. And there is more. My response to the second image did not occur by accident. The robe is called a humeral veil–from the Latin humus, or soil–and was once a burial shroud and then a baptismal vestment, thus signifying death and rebirth. 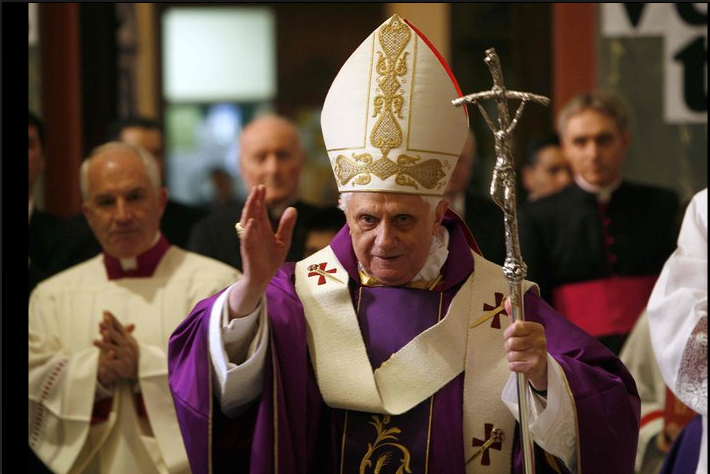 Likewise, the scepter is called a Monstrance–from monstro, to show–and is used to display the consecrated sacrament (the body of Christ) to the congregation. Thus, although one need not follow the path all the way through death to eternal life, the liturgical ritual clearly had marked out a path. What it cannot do is mandate a single valid interpretation of what is shown: if one sees faith and the promise of salvation, another can see empty ritual and collective delusion. Regardless of what I believe, I see a signifying animal that persistently, perhaps even nobly confronts the void with its need to communicate and ability to imagine a better world. Photographs by Darlo Pignatelli/Reuters; Pier Paolo Cito/Associated Press. Thanks to the Rev. Dr. Robert Clarke for technical support on church liturgy. An insightful analysis – I have been vaguely following the circus which is the Pope’s visit and this post is a reminder to me that whoever we are we are all ultimately frail human beings. I am Roman Catholic and I think your comments were wonderful in the sense that I also see the pope as a simple man in a particular calling – as we are all called in each of our own ways to live out our lives for Christ as priests, prophets, and kings. The pope is holding the monstrance the same way as my local priest would (with a similar shroud and without head coverings). 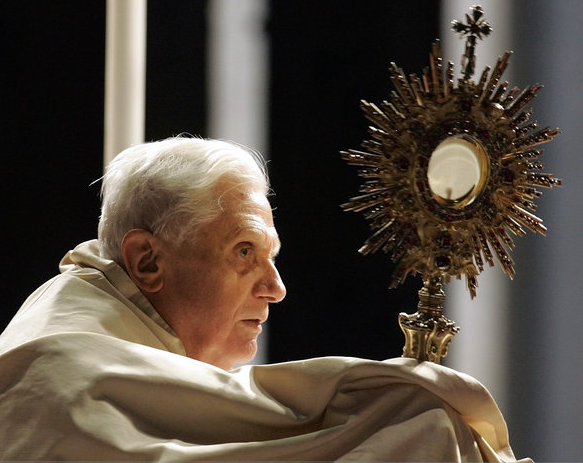 He is holding Jesus in that monstrance, so he bears it reverently, using both hands from under the shroud, lifting it up because the attention should be on Christ, and not on him.